Stockholm: Swedish poet Tomas Transtromer , who sets moral goals with unexpected yet simple imagery, won the 2011 Nobel Literature Prize on Thursday. 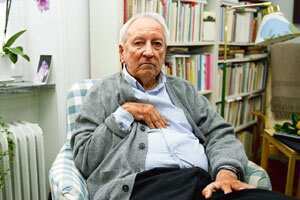 Transtromer, 80, was honoured “because, through his condensed, translucent images, he gives us fresh access to reality," the Swedish Academy’s jury said. He has been called a master of mysticism, who often presents a dream-like consciousness in which time slows to allow for dissection of the relationship between the inner self and the surrounding world. “Most of Transtromer’s poetry collections are characterised by economy, concreteness and poignant metaphors. In his latest collections... Transtromer has shifted towards an even smaller format and a higher degree of concentration," it added. The permanent secretary of the Swedish Academy, Peter Englund, told Swedish television that Transtromer had been nominated for the prize every year since 1993. Death, history and nature are common themes in the Swede’s poetry. “It’s about death and history and memory, watching us, creating us, and that makes us important because human beings are sort of the prison where all these great entities meet," Englund told the nobelprize.org website. “It makes us important, so you can never feel small after reading the poetry of Transtromer," he added. “He has quite a small production really, you could fit it into a not-too-large pocket book, all of it. So he has a very fast and very well contained production. He is not a prolific author," Englund said. Transtromer’s reputation in the English-speaking world owes much to his friendship with American poet Robert Bly, who has translated much of his work into English, one of 60 languages in which his poems have appeared. His work is rich in metaphors and imagery, painting simple pictures from everyday life and nature. His introspective style, described by Publishers Weekly as “mystical, versatile and sad", is in contrast with Transtromer’s life, which shows a constant, active commitment to working for a better world— and not just by writing poems. After publishing 10 volumes of poetry, Transtromer suffered a stroke in 1990 which affected his ability to talk. His wife Monica told Swedish news agency TT he was surprised to win the prestigious accolade. “He did not think he would get to experience this," she said, adding that a swarm of reporters—who have year after year gathered outside the couple’s apartment building in anticipation of a Nobel announcement—was at their home. “He also says he is comfortable with all these people who are coming to congratulate him and take pictures," she said. Transtromer has sold thousands of volumes in his native country, and his work has been translated into more than 60 languages. His books of poetry include The Great Enigma: New Collected Poems (New Directions, 2006), The Half-Finished Heaven (2001); New Collected Poems (1997); For the Living and the Dead (1995); Baltics (1975); Windows and Stones (1972), an International Poetry Forum Selection and a runner-up for the National Book Award for translation; The Half-Finished Heaven (2001). Transtromer, the seventh Swede to win the prestigious prize, will receive the 10 million Swedish kronor ($1.48 million, 1.08 million euros) award at a gala ceremony in Stockholm on 10 December, the anniversary of the 1896 death of the prize creator, Swedish industrialist Alfred Nobel. Last year, the honour went to Spanish-Peruvian author Mario Vargas Llosa.